2016 Commission letters and agency responses are provided as PDF files below. Download times of large PDFs will vary based on connection speed. Additional information on PDFs. Application from the St. George Reef Lighthouse Preservation Society to take marine mammals incidental to aircraft operations, restoration and maintenance activities, and tour operations at the St. George Reef Light Station on Northwest Seal Rock off the coast of Crescent City, California. Proposed creation of hard caps on the take of sperm, fin, humpback, and short-finned pilot whales, and bottlenose dolphins in the CA/OR Drift Gillnet Fishery. Application from Ann Pabst to conduct research activities on cetaceans in the western North Atlantic Ocean. Application from BBC to conduct filming activities on southern sea otters in California. Application from Alaska Department of Fish and Game to conduct research activities on harbor seals in Alaska. Application from David Johnston to conduct research activities on killer and minke whales in Antarctica. Application from North Slope Borough to conduct research activities on polar bears and walruses in Alaska. Application from Joseph Wilson to conduct filming activities on killer and minke whales in Antarctica. Application from John Durban to conduct research on cetaceans in Antarctica. Application from Excelerate Energy, L.P. and TetraTech, Inc. on behalf of Northeast Gateway Energy Bridge, L.P. and Algonquin Gas Transmission L.L.C. to take marine mammals incidental to operation, maintenance, and repair of the Northeast Gateway liquefied natural gas port and the Algonquin Pipeline Lateral facilities in Massachusetts Bay. Application from Tamara McGuire to amend her permit to conduct research activities on beluga whales in Cook Inlet, Alaska. Application from the City of Kodiak Port and Harbors to take marine mammals incidental to replacement of a transient float in Kodiak, Alaska. Proposal to list the North Island subspecies of Hector’s dolphin (the Māui dolphin) as endangered and the South Island subspecies of Hector’s dolphin as threatened under the Endangered Species Act. Draft programmatic environmental impact statement regarding proposed geological and geophysical activities on the Gulf of Mexico Outer Continental Shelf. Application from James Harvey to conduct research on cetaceans in California. Application for Exempted Fishing Permit to test deep-set swordfish buoy gear off the U.S. West Coast. Application from the U.S. Army Corps of Engineers, Portland District to take marine mammals incidental to rehabilitation of a jetty system in Oregon and Washington. Interim final regulations to prohibit approaching humpback whales in Hawaii. Application from Southwest Fisheries Science Center to conduct research on pinnipeds in Antarctica. Application from SMRU Consulting North America, LLC, to conduct research on marine mammals in waters off Washington. Application from Rachel Cartwright to amend her permit to conduct research activities on cetaceans in Hawaii, California, and Alaska. Proposed regulations to prohibit swimming with and approaching Hawaiian spinner dolphins. Commenting on a Canadian Action Plan to reduce entanglements of North Atlantic right whales and possible useful measures to mitigate right whale deaths and injuries from fishery interactions. The Draft Road Map to outline their national implementation strategy for their ecosystem-based fisheries management agency policy. Application from California Department of Fish and Wildlife-Central Region to take marine mammals incidental to construction activities in association with a tidal marsh restoration project in Elkhorn Slough, California. Comments on RESTORE Act Draft Comprehensive Plan Update 2016 for the Gulf of Mexico. Application from U.S. Geological Survey to amend its permit to conduct research on captive polar bears. Application from U.S. Navy to conduct a waterfront restoration project at the Portsmouth Naval Shipyard in Kittery, Maine. Draft Supplemental Environmental Impact Statement/Overseas Environmental Impact Statement for Surveillance Towed Array Sensor System Low Frequency Active sonar. Application from George Watters to conduct research on pinnipeds in Antarctica and the South Shetland Islands. Application from Craig Matkin to conduct research on cetaceans in Alaska. Application from Scott Kraus to conduct research on North Atlantic right whales in the western North Atlantic Ocean. Application from the Center for Coastal Studies to conduct research on North Atlantic right whales in waters off New England. Application from Neptune LNG LLC to take marine mammals incidental to maintenance, repair, and decommissioning activities at its liquefied natural gas Deepwater port off the coast of Massachusetts. Environmental impact statement for Lease Sale 244 within the Cook Inlet, Alaska, Outer Continental Shelf planning area. Application from SeaWorld, LLC, to take one non-releasable male Pacific walrus for the purpose of public display. Application from Alaska Department of Transportation and Public Facilities to take marine mammals incidental to reconstruction of the ferry terminal in Gustavus, Alaska. Application from Stephen Trumble to import, possess, and receive samples from cetaceans. Application from Chicago Zoological Society to import, receive, possess, and export samples from Peruvian fur seals and South American sea lions. Application from University of California Santa Cruz to import, receive, and possess samples from polar bears. Application from U.S. Navy to take marine mammals incidental to demolition and replacement of the fuel pier at Naval Base Pt. Loma in California. Application from Janice Straley to conduct research on cetaceans in Alaska. Application from Passion Planet to film northern sea otters in Washington. Application from California Department of Transportation to take marine mammals incidental to conducting dismantling and demolition activities associated with replacement of the east span of the San Francisco-Oakland Bay Bridge in California. Application from BBC Natural History Unit to film marine mammals in California during a one-year period. Application from Allyson Hindle to modify her permit to conduct research on Weddell seals in Antarctica. Environmental assessment for commercial wind lease issuance and site assessment activities on the Atlantic Outer Continental Shelf off New York. Application from BlueCrest Alaska Operating, LLC to take marine mammals incidental to conducting oil and gas exploration activities in Cook Inlet, Alaska. Response to Service actions regarding the June 2016 polar bear meeting and Alaska Nanuuq Commission. 90-day finding on a petition to list the Taiwanese humpback dolphin as threatened or endangered under the Endangered Species Act. Application from Alaska Oil and Gas Association seeking authorization to take polar bears and walruses incidental to oil and gas operations in the Beaufort Sea, Alaska. Application from Aleut Community of St. Paul to conduct research on pinnipeds in Alaska. Application from St. George Traditional Council to conduct research on pinnipeds in Alaska. Application from SeaWorld LLC to permanently maintain up to six non-releasable Guadalupe fur seals. Application from Quintillion Subsea Operation, LLC, to take walruses incidental to subsea cable-laying activities in Alaska. Application from Laura Graham to conduct research on captive polar bears. Application from the Northwest Fisheries Science Center to take marine mammals incidental to fisheries research activities in the Pacific Ocean. Application from Fairweather, LLC to take marine mammals incidental to anchor-retrieval activities in the Beaufort and Chukchi Seas, Alaska. Application from the San Francisco Bay Area Water Emergency Transportation Authority to take marine mammals incidental to ferry terminal expansion and renovations in San Francisco, California. Outer Continental Shelf Oil and Gas Leasing Proposed Program for 2017–2022 and associated Draft Programmatic Environmental Impact Statement. Application from Living Planet Productions/Silverback Films to conduct filming activities on bottlenose dolphins in Florida. Application from BlueCrest Alaska Operating, LLC to take northern sea otters incidental to conducting oil and gas exploration activities in Cook Inlet, Alaska. Proposed rule to designate the Sakhalin Bay-Nikolaya Bay-Amur River stock of beluga whales as depleted. Application from the Natural History Museum of Los Angeles County to receive, possess, import, and export samples from marine mammals. Application from the Service’s Office of Science and Technology to conduct research on marine mammals off California. Application from Paul Ponganis to conduct research on California sea lions in California. Application from the Municipality of Skagway to take marine mammals incidental to reconstruction of the ore terminal in Skagway Harbor, Alaska. 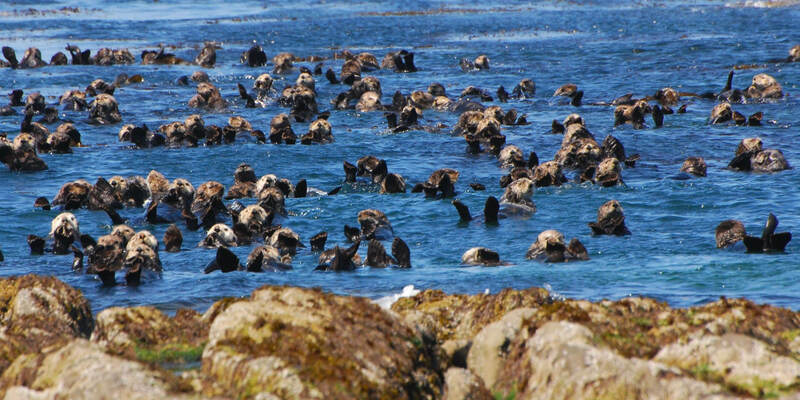 Application from Silverback Films to film southern sea otters in California. Application from Deepwater Wind Block Island, LLC to take marine mammals incidental to cable-laying operations for the Block Island Wind farm off Rhode Island. Application from Randall Davis to conduct research on northern sea otters in Alaska. Application from Idaho, Oregon, and Washington seeking authority for lethal removals of predatory California sea lions at Bonneville Dam. Proposed rule to amend its regulations implementing the Animal Welfare Act as they pertain to marine mammals. Application from Lamont-Doherty Earth Observatory to take marine mammals incidental to conducting three marine geophysical surveys in the southeastern Pacific Ocean. Application from DONG Energy Massachusetts LLC to take marine mammals incidental to geophysical and geotechnical surveys off Massachusetts. Application from BBC to amend its permit to film southern sea otters in California and northern sea otters in Washington. Information on the Indus River dolphin for use in a 5-year review of the species’ status under the Endangered Species Act of 1973. Proposed rule for standardized bycatch reporting methodology. Interim final rule to enhance documentation and captain training requirements associated with the dolphin-safe label on tuna products. Application from Port of Kalama to take marine mammals incidental to construction of the Kalama Manufacturing and Marine Export Facility on the Columbia River in Washington. Application from Jim Darling to conduct research on cetaceans in Hawaii and Alaska. Draft monitoring plan for nine distinct population segments of the humpback whale not listed as threatened or endangered under the Endangered Species Act. Final Report on the Atlantic Coast Port Access Route Study. Application from U.S. Navy to take marine mammals incidental to conducting construction activities in Port Angeles, Washington. Application from the City of San Diego to take marine mammals incidental to conducting a sand quality survey at the Children’s Pool in La Jolla, California. Proposed reclassification of the West Indian manatee from endangered to threatened. Application from California State University, Bakersfield to conduct research on pinnipeds held at rehabilitation facilities in California. Application from Quintillion Subsea Operations, LLC, to take marine mammals incidental to conducting cable-laying activities in Alaska. Application from Glacier Bay National Park to take marine mammals incidental to conducting seabird surveys in Alaska. Draft environmental assessment for the issuance of annual incidental take authorizations for oil and gas activities in 2016 in Cook Inlet, Alaska. Proposed rule on the Seafood Monitoring Program. A revision to the revised draft guidance regarding the acoustic thresholds for activities causing an onset permanent threshold shift and temporary threshold shift for marine mammal species under the Service’s jurisdiction. Marine Stewardship Council’s Public Comment Draft Report addressing Certification Requirements for the Northeastern Tropical Pacific purse seine tuna fishery of Mexico. Application from Evin Hildebrandt to receive, possess, and create cell lines from cetaceans. Application from Pam Miller to receive, possess, and export samples from marine mammals. Application from ExxonMobil Alaska LNG LLC to take marine mammals incidental to geophysical and geotechnical survey in Cook Inlet, Alaska. Application from Sonoma County Water Authority to take marine mammals incidental to construction and maintenance activities in association with estuary management activities at the Russian River near Jenner, California. Application from National Marine Mammal Laboratory to conduct research on pinnipeds in Alaska. Application from Anthony Pagano to conduct research on captive polar bears. Application from Washington State Department of Transportation to take marine mammals incidental to upgrading the Coupeville Ferry Terminal on Whidbey Island, Washington. Application from the Indianapolis Zoo to take one non-releasable male Pacific walrus for the purpose of public display. Proposed resolutions, decisions, and agenda items being considered for the Conference of Parties of the Convention on International Trade in Endangered Species of Wild Fauna and Flora. Application from Ann Zoidis to conduct research on cetaceans in Hawaii and the Mariana Islands. Notice of intent to prepare an environmental assessment and call for information and nominations for commercial wind leasing and site assessment activities on the Atlantic Outer Continental Shelf offshore South Carolina. Request for comments on the incidental taking of five endangered or threatened populations of marine mammals in various Bering Sea and Aleutian Island trawl and longline fisheries in Alaska. Application from Port of Anchorage to take marine mammals incidental to a test pile program in Anchorage, Alaska. Application from UniSea, Inc., to take marine mammals incidental to dock construction activities in Unalaska, Alaska.